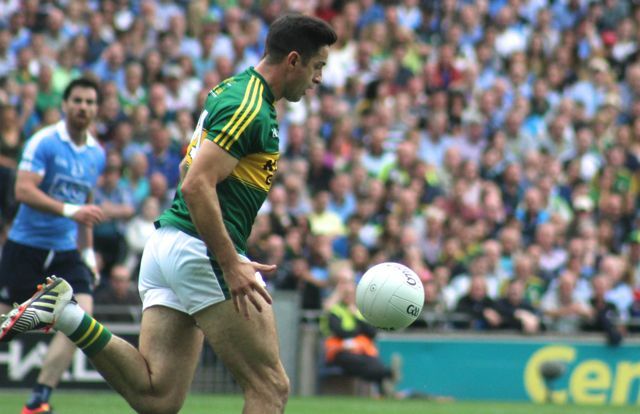 Have We Seen The Last Of These Kerry Warriors In Croke Park? NATURALLY, after a championship-ending defeat and another season done and dusted, retirements are not too far away from the discussion. Four Kerry legends in particular must be weighing up their options of whether the bodies can take another crack at Sam. The Rathmore man was a late inclusion to the side yesterday, slipping in to play effectively as a sweeper. Those sitting on the Cusack Stand side won’t forget his second half collision with Philly McMahon, which, okay, was not spot on the shoulder, but was classic Mahony. Leaving the pitch yesterday, the defender who made his debut in 2004 shed a few tears, perhaps an indication he was taking stock of a five-time All-Ireland winning career. Although watching Mahony as he strode forward against Dublin late on might suggest the body is well capable of going another few rounds with the best. Aidan O’Mahony in action against Dublin on Sunday. Photo by Dermot Crean. Arguably the greatest corner-back of all time and the last of the Ó Sé dynasty to wear the green and gold for the seniors. 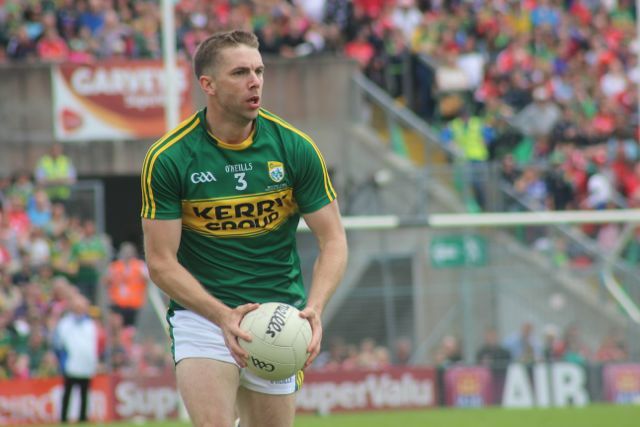 From Darragh to Marc, there has been 20 unbroken years with an Ó Sé brother on the Kerry panel. Like his brothers, Tomás and Darragh, if he decides to go he will have finished his career with his boots on in Croke Park which is only fitting for a player who makes up one third of the arguably the greatest set of inter-county brothers the sport has ever known. 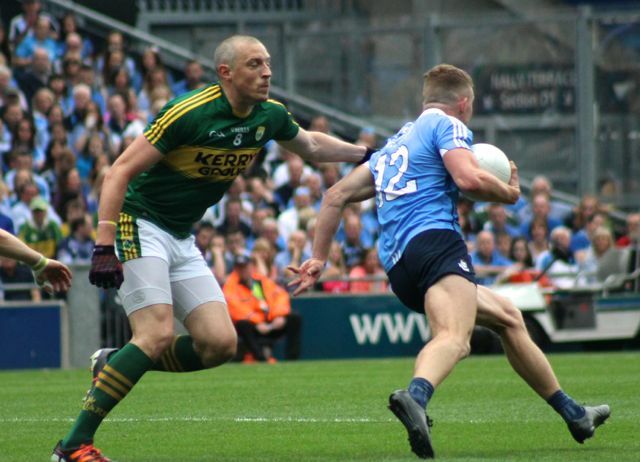 The emotional image of Kieran Donaghy sharing a moment with his daughter Lola Rose on the pitch of an emptying Croke Park may suggest the Austin Stacks man was contemplating having a last look around from the turf. A groin injury he picked up in the second half would also suggest that imposing frame that has terrified full-back lines for a decade is feeling the rigour of all those challenges down the years. The Star has also a book release in the pipeline, which can be a reliable indicator that the end is near. Kieran Donaghy attempts to halt the run Ciaran Kilkenny on Sunday. Photo by Dermot Crean. The least likely of the four to finish up, the Gooch showed us plenty of his brilliant best yesterday against a Dublin team that needed to be on top form. 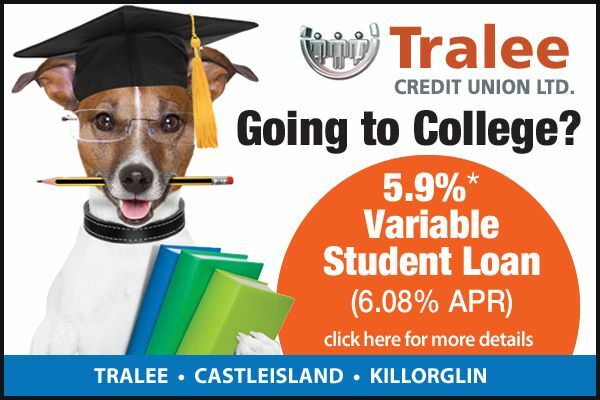 Injuries have hampered him in recent years, so you’d fear that one more long-term lay-off will signal the end of the 33-year-old maestro who was this year playing in his 14th season as a senior inter-county footballer. Economy of movement is a vital part of the Gooch’s game as he enters the autumn of his career. Yesterday he seemed to strike the right balance which suggests he is capable for another season. 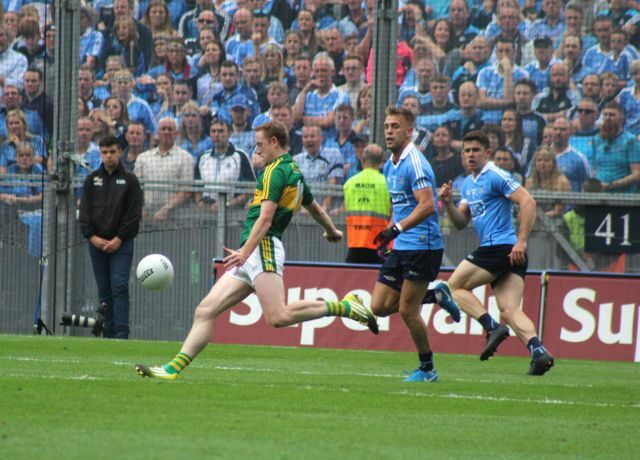 Colm Cooper swings that left boot at the posts against Dublin in the All-Ireland semi-final on Sunday. Photo by Gavin O’Connor. Could The New Structure Revitalise The Football Championship?